The Department recently released the 2017 Fall Enrollment Report, which provides information about the full- and part-time fall enrollment at each of Iowa's 15 community colleges. According to the report, 90,531 students were enrolled in community colleges this fall, down less than one percent from last year. However, part-time enrollment reached a record high, comprising 62.2 percent of total fall enrollment. The number of high school students taking community college courses through joint enrollment grew 2.7 percent to 34,928 students, accounting for 38.6 percent of community college fall enrollment. Contact Barbara Burrows, chief of the Bureau of Community Colleges, at 515-281-0319, or barbara.burrows@iowa.gov with comments or questions about the report. Planning for the second annual Expanding Possibilities: Adult Education and Literacy Virtual Conference 2018 is well underway. The virtual conference, which will be held from January 30 through February 1, is a collaborative effort between the Iowa Department of Education, Division of Community Colleges and Workforce Preparation, Adult Education and Literacy, and the Iowa Literacy Council . Adult education administrators, educators, and other stakeholders will benefit from sessions covering best practices and resources both in- and out of state-related, but not limited, to technology, classroom management, blended learning, distance education, and cultural competency. This year we are excited to welcome Dr. Lyn Cochran, president of Scott Community College, as the conference keynote speaker. Dr. Cochran began her official duties as president in August, prior to the start of the 2017-2018 academic year. Prior to her appointment, Dr. Cochran served as assistant vice president for organizational development at Iowa State University and as a lecturer for both Drake University and Iowa State University in the area of qualitative research methodology. Division consultants are developing an incredible adult education conference program and are currently accepting proposals for the remaining open session times. Please consider sharing your expertise by submitting a session proposal for consideration. Conference registration, speaker bios, and session descriptions will be posted on the Department’s website in the next few weeks. Questions about the virtual conference can be directed to Marcela Hermosillo, education consultant, at marcela.hermosillo@iowa.gov, or 515-281-4723. Veterans eligible for education benefits, including those available under the Post-9/11 GI Bill, may use those benefits to pursue registered apprenticeship and other approved on-the-job training programs (OJT/APP). The OJT/APP program allows veterans to learn a trade or skill through structured training and close supervision on the job rather than attending formal classroom postsecondary education instruction. Over 470 on-the-job training and apprenticeship programs have been approved in Iowa. A searchable database of approved programs by state is available on the United States Department of Veterans Affairs website. Eligibility requirements generally entail submitting a training request form that specifically outlines the proposed program, wages, and standard workweek information, as well as the company contact name and phone number. For more information and approval requirements related to OJT/APP programs in Iowa, please contact Mike Dommer, the state approving agency director for the state of Iowa, at michael.dommer@iowa.gov, or 515-281-3516. Alex Harris, the Department's state director of adult education and literacy, was interviewed recently for a national story about ways for students to demonstrate competency leading to the issuance of high school equivalency diplomas. Harris discusses the state's selection of Educational Testing Service's (ETS) HiSET exam and the passing of House File 473, which aims to increase the number of Iowans obtaining high school equivalency diplomas by providing flexibility in how competency is demonstrated. Last month, Governor Kim Reynolds signed a proclamation recognizing the importance of energy as one of the state’s high-growth industries. Iowa Careers in Energy Week, which was held Oct. 16-20, helped build awareness about the different careers available in today’s rapidly changing and growing energy field. To give students, parents, and educators a better understanding of what jobs in energy look like, the Iowa Sector Partnership Leadership Council worked with the Iowa Department of Education, the Iowa Energy Workforce Consortium (IEWC), the Council for Adult and Experiential Learning, and Iowa Central Community College to develop a new tool that can be used when talking with students. Matching education and skills with different high-demand jobs in energy, the Opportunities in Energy: Iowa tool shows how career opportunities exist for every type of person, no matter interest or skill. “Students need to see themselves working in high-growth fields, such as energy,” said Jeremy Varner, division administrator for the Iowa Department of Education's Division of Community Colleges and Workforce Preparation. This fall, students across the state had the opportunity to work with chef mentors and gain real-world experience as part of the state's ProStart programs. ProStart is a two-year educational program supported by the national and state Restaurant Association Educational Foundations. This career-building program blends classroom learning with mentored work experience to teach high school students the management and culinary skills needed for careers in the restaurant and food service industry. Currently, 28 Iowa high schools offer ProStart programs. One such program teamed chef mentors with high school students from the Bettendorf area to prepare a buffet that served over 100 food service industry professionals, educators, administrators and visitors. 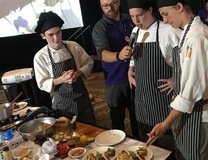 Additionally, Cedar Rapids students were invited to work with Chef Elizabeth Hill to prepare the appetizer course for last month's Iowa Restaurant Association Culinary Affair, a seven-course decadent gourmet meal prepared by Eastern Iowa’s top chefs. Another opportunity put a fun spin on food preparation. Des Moines Central Campus ProStart students participated in a cooking competition as part of the Midwest Food Recovery Summit at the Downtown Des Moines Marriott. The Marriott saved food scraps throughout the week for use in the competition. Teams of students had 30 minutes to plan a menu using the food scraps and an additional 60 minutes to prepare the food. These experiences, which are made possible through strong public/private partnerships between education and industry, give students competitive advantages in job searches and open doors to postsecondary opportunities. Today, Iowa’s restaurant industry accounts for nearly 10 percent of Iowa’s workforce, and these experiences better prepare students to succeed in culinary and food service careers. For more information on preparing students for college and career success through programs like ProStart and other human services/family and consumer sciences (FCS) programs, contact Lisa Stange, CTE consultant, at lisa.stange@iowa.gov, or 515-242-5032. This month, a work group charged with studying ways to expand computer science opportunities for all students released recommendations that will position Iowa to become a national leader in computer science education. The recommendations include a vision for computer science to eventually become a high school graduation requirement. 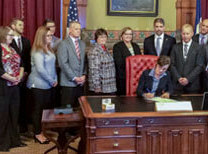 Additionally, the work group recommends that computer science professional development be made available to teachers and for computer science education to be expanded through a variety of platforms, including concurrent enrollment courses and Iowa Learning Online.